There's no denying that the construction industry has been slow to hop on the technology bandwagon. But it is possible to teach an old dog new tricks. Thanks to Raken and other types of new technology for construction, firms are saving both considerable time and money in doing reporting and other types of paperwork. And the benefits for the industry don't just stop there. While some of the latest innovations in construction technology "in the hopper" won't be seen for awhile at project sites, they'll be taken for granted in another decade or two. Below are just a few of the ones that will be making construction sites in the near future smarter, safer, more efficient, and more profitable. 3D-MC Three Dimensional Machine ControlYou think those road crews are doing it "old school"? Like everyone else in the industry, they’re embracing new construction industry technologies, including the use of lasers. But there's a problem. Current laser technologies don't do well on curves, which many roadways alas, tend to have. The solution? Roadway construction equipment is currently guided by hubs, staking, or elevated string lines. The 3D MC system utilizes three "modules" to guide equipment, consisting of a total station, receiver, and control system device. Productivity has been greatly enhanced using this system in trials. Concrete ClothStorm water is an increasingly dirty word in construction, in every sense of the word. Not only does the runoff that it creates endanger properties through erosion, it can create waterway environmental hazards as well. When storm water was addressed in the past, it was in the form of concrete chutes or earthen ditches that needed frequent maintenance or repair themselves to work effectively. Just installing such methods ran the risk of creating more erosion or environmental damage. But the development of a new material called geo-synthetic cementitious composite mats(GCCM) and trademarked and sold under the name Concrete Cloth are making an enormous difference. Now being used at a variety of construction and municipal sites, the GCCMs are placed on the ground first, making it possible to use concrete on slopes, in water, and in other difficult situations, without workers having to use forms, do mixing, or be forced to use a lot of equipment. Movax Robotic Hydraulic Vibratory Pile DriverPile driving sheeting at sites currently involves lots of equipment, lots of workers, and lots of opportunities for accidents. 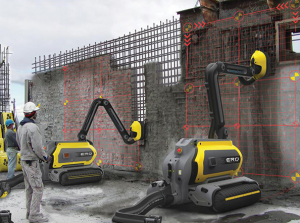 The excavator-mounted Movax robot allows a single operator to pick up a 50 foot sheet and drive it, thread it, and place it without dropping it.